· All G-keys in our mice, keyboards and headsets are now selectable as bindable keys directly in the in-game interface. · The multi-color LED lighting in our new Logitech G510s and G19s keyboards will switch to indicate the color of your team, including in colorblind mode. 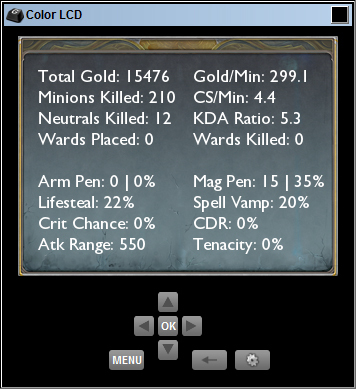 · The Logitech G510s and G19s GamePanel LCD now displays constantly updating stats typically only available in the character subscreen, such as cool-down reduction, or stats not previously available, such as gold per minute. We hope you’re excited as we are about these new features. Thanks to the Riot team for working so hard with us to make it happen. Stay tuned here for more updates on Logitech’s gaming sponsorships, and best of luck to all the teams in the League of Legends Season Three Championship Series! I really like it, I have a logitech g15 the problem is that when I die my keyboard goes black and I can’t read the interesting info on my lcd while dead I would have time to look at it, also all my keys go dark. That’s the behavior of the LOL integration, so there isn’t a way to change that from the Logitech side. But we can collect info on what customers want and pass it on to Riot. Which G15 are you using? Great news thanks logitech for continuing to support. I have a Logitech mouse mx 518 (2 of these one for spare), A logitech g 19 and a Logitech G35. You continue to support esports and me and my friends will continue to support logitech. Please also don’t forget about startcraft 2 another great esports title. We support eSports in a variety of ways, so while we may not be a sponsor of SC2 currently, we sponsored part of the SC2 event at Dreamhack. Serious gaming is a definite focus of our team. So, to add this support into a game doesn’t require sponsorship: It depends on a developer integrating it into their game. If you want LCD support in DOTA2, let the developer know, and if they want to do it, we can assist with the integration. Thanks, but because of this the G710+ is now bugged. The backlit keeps going to full brightness at the start of each game and every time one dies. I’ll pass on your feedback and see what we can get resolved. Will this be available for the G15 as well please?! or the G13? How do we get our hands on this ? is it compatible with the G13 as well? god i hope so. Fully. You only have the monochrome screen, so you have to use the left-most buttons on the screen to change between the stats, but you get all the same info. Just update you LoL and it will work automatically. This is great but I don’t like it when the backlighting is disabled on death. Please pass that along. Thanks for the feedback. We will pass this on to our internal teams. Hey, I would to know sth about working LED backlight in G110 Keyboard – because only reaction in playing LoL is change colour of LEDs to rather faded purple – it doesn’t depends on team’s colour and it’s always that. Is the G110 supported completely? We’ll have some people investigate this, and if we can reproduce, we’ll pass this on to Riot. 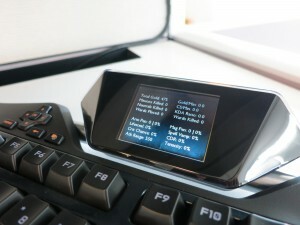 This sounds great for some of the Logitech keyboard owners, what about those who don’t have G19 ou G510? If yes could anyone please show me how to or a website that does it? We’ve improved profile detection so it can track League of Legend’s .exe directory shifts when the game updates, so you can assign complex macros with no problem. Plus, now you can directly assign G-Keys to binds within League of Legends. Just make sure you’re running the latest version of LGS, launch the game, then in your keybinds window, assign your G-Keys directly. Please tell me how to turn it of. I have already set my macros how I want, and my dpi now when ever I tab out it resets it to a different colour lowering my dpi and changing my macros. It’s rarther annoying. Please can you tell me how to turn it off. Or add a feature that will let you turn it of. This will explain how to disable the bug with the back light staying of upon death. I wouldn’t mess around with the game’s files. I have an easier solution if you want to disable the lighting. Open LGS, and click on the gear icon in the lower right of the LGS window. In the options window, one of the options is “Allow games to control illumination”. Uncheck this, then click OK. The idea is great however i prefer my keyboard to have the red lighting constantly as i find it easier to see, i don’t mind the blue but the death dim is very irritating and i find myself pressing the “M1” key to change it to my regular setting far too often, i would prefer it if there was an option to have it instead of it being forced onto me. I want to buy a new keyboard and the G19s is currently not available for me. Do I have the exact same thing on the LCD screen when playing LoL with a G19 or is there a difference? Is it possible to use this when playing HoN? Seeing as its almost the same game and all. Thanks for the comment. Unfortunately that is not possible. Sorry. In-game support for the applet depends on the game developer. We’ll verify in house then pass on your request. I’m glad that Logitech is sponsoring League of Legends but disappointed that at the same time that League of Legends is hindering the capabilities of my keyboards. I’ve gone from a G15 to a G710+ and have liked the added touch of integration with the back-lighting. However, it kills me that there is no support for the multimedia keys on my keyboards. Please try to get Riot Games to fix this issue as I’ve read that other people using other brands of keyboards have no issues. The media keys also work with other games but this game that you decided to sponsor breaks this feature. As a long time Logitech supporter (waited years until Logitech made a mechanical keyboard), I hope that this can be resolved or I will be looking into other keyboards. I just bought a Logitech G510, will this work with my keyboard?